Each year, with Christmas on the horizon, millions of men will venture forth to buy gifts for their wives. And most of them will have no idea what they are doing. Certainly, most guys mean well, and many of them are truly interested in finding the perfect gift for their wives. But they all suffer from the one factor which renders them incapable of intelligent Christmas shopping: they are men. This may seem to be an overly simple generalization, and an insult to one of the great genders of the human race. But think about it for a moment; men are born with an incredible array of diverse talents, ranging from the possible discovery of life on other planets, to the possible destruction of all life on this planet. Yet, this same group will, year after year, prove themselves utterly incapable of the simple act of buying the right Christmas gift for their wives. So, as a man who has made every possible shopping mistake at least twice, I offer this guide to finding your wife a truly perfect Christmas gift. The first step on this road to true Holiday Happiness is to free yourself from those wise old axioms which men have been tripping over for so many years. The three most insidious of these include the following. The first is, “It’s the thought that counts”. This phrase is repeated untold millions of times on Christmas Day, usually in a meek and desperate voice. It is a mantra which blows across the land like an ill wind; women always expect it but still find it dry and annoying. This phrase was actually invented by a secret group of advertising executives in New York, none of whose wives were happy with their gifts. They were hoping to save not only themselves but all of their fellow men. Their purpose was grand and their efforts noble but they underestimated the intelligence of the average house wife. The second saying is, “If you like it, so will she“. This can be a tragic error. Any man dumb enough to believe this one deserves whatever he gets. Just because you want something does not mean she will appreciate it. This includes, among other things, season tickets for the local sports team, fishing rods or any kind of power tools. The last of these axioms is, “Be economical, and get a gift you can both enjoy“. Christmas is not a time for economy. It is a time for splurging carelessly and ignoring the guilt. For rushing through stores with wild abandon and a pocketful of cash. For tapping your credit cards on the machine until the chip is dead. Being overly thrifty will not only get you the cold shoulder from your wife, but also a letter from the credit card company asking if you would like your credit limit increased. There is one exception to this last saying about getting a gift you can both enjoy. It generally involves a brand new luxury vehicle which comes with two sets of keys, neither of which you will ever get hold of. The second pitfall is advice from your buddies. Men trade advice as easily as they do comments about the weather yet they treat each word as if it came directly from the mouth of Moses himself. If you don’t believe me, just think of the last time you invested in the stock market on the advice of a friend, when he told you that shares in that gold mining company would never go down. Some other bits of advice you must remember. Avoid procrastination. What seemed like a good idea in September just does not work at five o’clock on Christmas Eve. Like ordering jewellery from Bloomingdales, or installing that new dishwasher you have yet to buy. And never ask your wife what she wants for Christmas. The very fact that you had to ask means you haven’t been paying attention all year long, otherwise you would already know the answer. Now that you know what not to do, here is a simple but effective strategy for buying your wife the perfect Christmas gift. Go directly to the mall after work and sit on a bench which provides a good view of the passing shoppers. Watch carefully for a woman who resembles your wife in age and clothing style. Approach her quietly and humbly, looking as much as you can like a little lost boy. Her mothering instincts will kick in and she will be more than happy to help you, especially after you explain the trouble you are having finding a simple yet elegant gift for your wife. Then write down everything she says, no matter how ridiculous it sounds. Remember, you are a man so it is natural that you will not understand the logic behind her suggestions. Then go and buy everything on that list. There will not be many presents to buy but they will be the perfect ones. 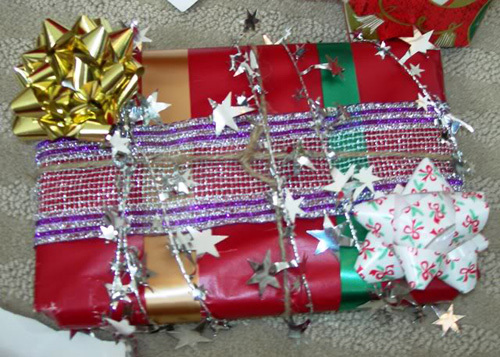 Then go home, wrap the gifts and place them in a conspicuous spot under the tree. When your wife asks if you are not feeling well because after all it’s Christmas Eve and you are not at the mall, just sit back, smile and enjoy yourself. The worst part of Christmas is now over.